DHARAMSALA, India -- The Dalai Lama, the spiritual head of the Tibetan nation, is known worldwide for his advocacy of non-violence, peaceful coexistence, environmental protection and human rights. But the 82-year-old Buddhist monk is worried about the rise of nationalism and selfishness around the world and in the United States. In wide ranging remarks to a unique conference of Tibet supporters here in northern India, the Dalai Lama said he was concerned about President Trump’s “America first” policy, America’s stance on global warming and the use of military tools to solve international problems. He also praised the United States and expressed hope that the American people will continue to do the right things, including with respect to Tibet. The Dalai Lama is concerned that the United States, despite being “the leader of the free world,” was becoming more “selfish, nationalist,” he said. But the American Congress and people have long supported the cause of Tibet and human rights, and he thinks that will continue, he added. The Dalai Lama also lamented that Trump doesn’t pay more attention to the issue of global warming, which, he said, knows no borders and no religion. The event, called the Five Fifty Forum, was hosted by the Tibetan government-in-exile, which is based in this northern Indian mountain town. 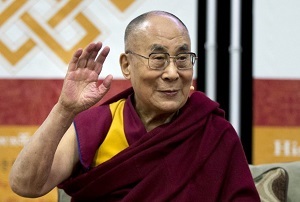 The Dalai Lama has been living in India since he fled Tibet in 1959 and has not been allowed to return. The forum was held under Chatham House rules, which forbid quoting participants. But the leadership of the Tibetan government-in-exile gave me permission to publish the Dalai Lama’s remarks. The Tibetan leader, who is believed by followers to be in his 14th reincarnation, criticized the use of military force around the world and called on nations to solve problems through diplomacy and negotiation rather than violence. He said the use of military power, even by the United States, never achieves its goal. “Every problem on this planet, including our problem, must be solved with respect and mutually acceptable [solutions],” he said. The Dalai Lama’s commentary on world events was not limited to the United States. He said that the Britain had erred in voting to leave the European Union, and he attributed that decision to nationalism as well. The Dalai Lama said he wants to engage with China to find a mutually acceptable solution for Tibet. He added that the Tibetan people must also be ready to talk to China if there’s an opening. That doesn’t seem likely, considering that the Chinese government cut off dialogue with the Tibetans in 2010 and has pursued a brutal repression campaign in the region ever since. He is arguing against current trends for a world based on common interest, global integration, defense of human rights and shared responsibility for the environment. For most of his long life, the United States has agreed with him and led that effort. Will that continue? Even the Dalai Lama doesn’t know.